retail chains, outlets or via online using global credit cards, debit cards, charge cards, e-banking, and e-wallets. STEP 1 Key in credit card or debit card details. Click "Pay Online". 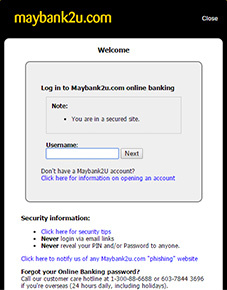 STEP 2 Key in "Pin Code" sent to mobile phone. Click "OK"
to proceed and complete payment. You can use your debit card to make payment as long as it is a Visa or MasterCard brand. This may be a temporary network issue with your respective credit card bank. Kindly make payment again after 30 minutes. If problem persist, kindly contact your credit card issuing bank. Kindly make sure your credit card has sufficient balance and credit limit to proceed with payment. You may contact your respective credit card bank to inquire further. 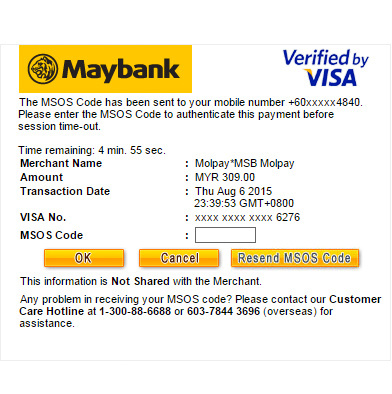 You may choose to resend the pin code from the bank payment window. If problem persist, kindly contact your respective credit card bank. 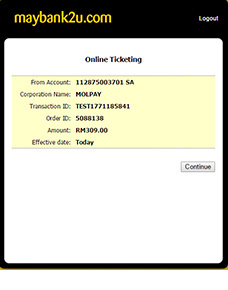 You may send an email to MOLPay at support@molpay.com along with your “Order ID” . MOLPay will double check on your payment status. Kindly make sure you have sufficient bank balance to proceed with payment. 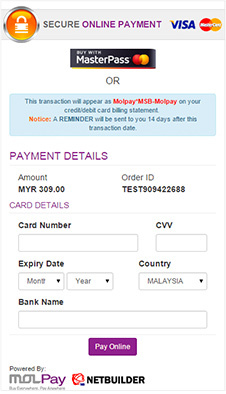 If this problem still persist, kindly contact email support@molpay.com along with your Order ID for them to check. You may send an email to MOLPay at support@molpay.com along with your "Order ID". 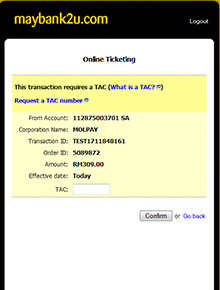 MOLPay will double check on your payment status. Customer will receive their refund within 7 to 14 working days after the payment has been cancelled.